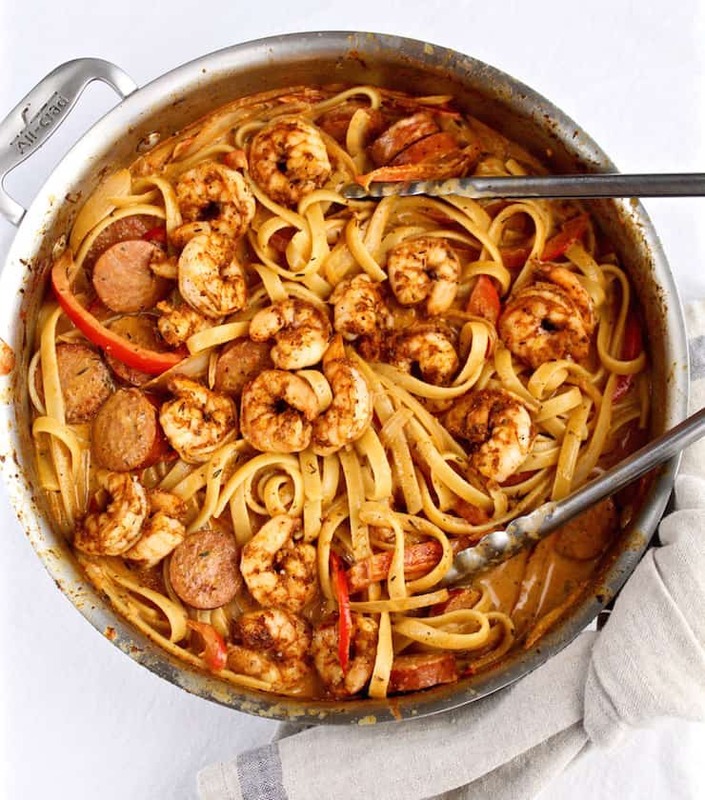 A spicy and creamy cajun shrimp pasta dish with blackened shrimp and andouille sausage. Do you have a dish that you always order at a favorite restaurant? I do, and it’s Creole Pasta at this lovely little bistro in our new neighborhood. I crave it and I wish I could try something else from the menu, but I just can’t. Obsessed and inspired, I set out to make something like it at home. 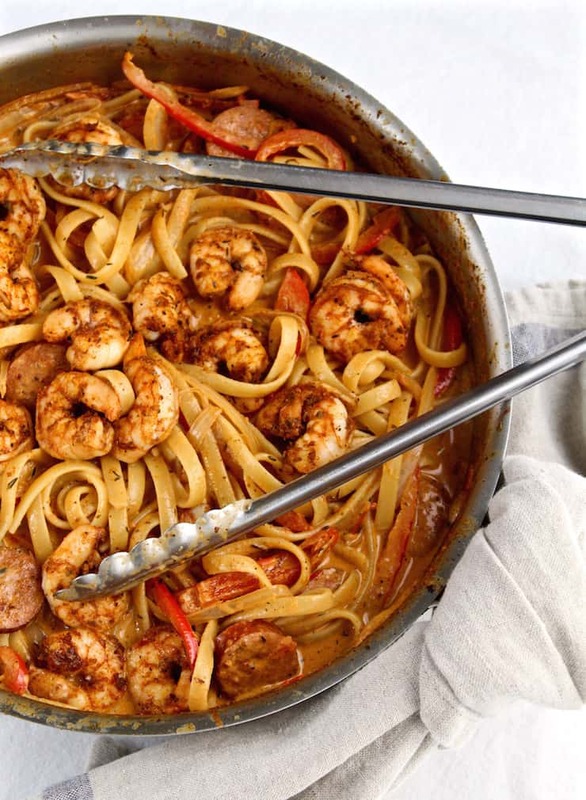 It took a few tries, but I came up with a creamy cajun shrimp and sausage pasta dish that can compete ~ alleluia. I love cajun spices or creole seasonings, both terms seem to be used interchangeably, but they are actually a little different. I’m no expert but, simply put, some label Creole food as “city food” and Cajun as “country food”. I’m just gonna go with cajun here, and leave the nuanced differences to others. This dish has such great flavor and heat, neither of which overwhelms the other. 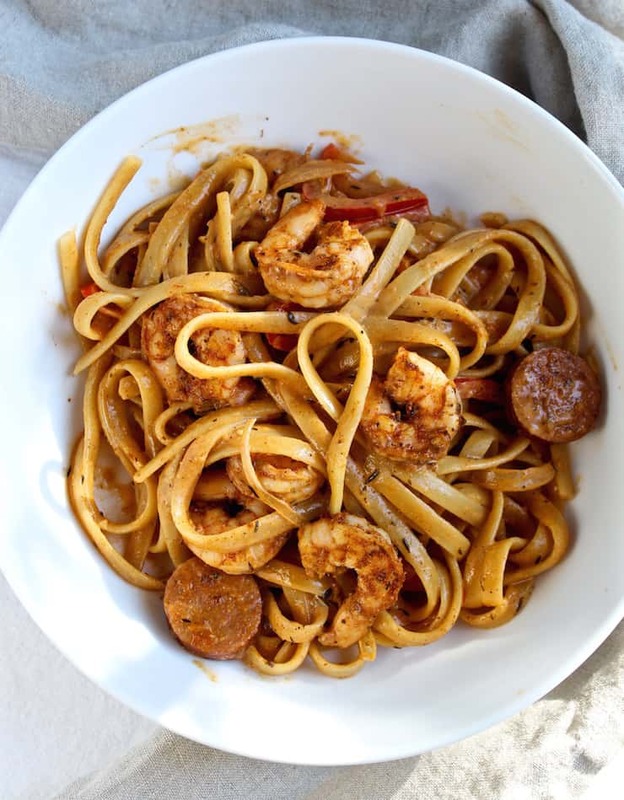 The sauce is creamy and decadent and tossed with fettuccine, blackened shrimp and andouille sausage. Cajun spices are great on shrimp, seared or “blackened” for a few minutes so they’re not overcooked and rubbery. Andouille is a smoked sausage full of wonderful Louisiana cajun spices. 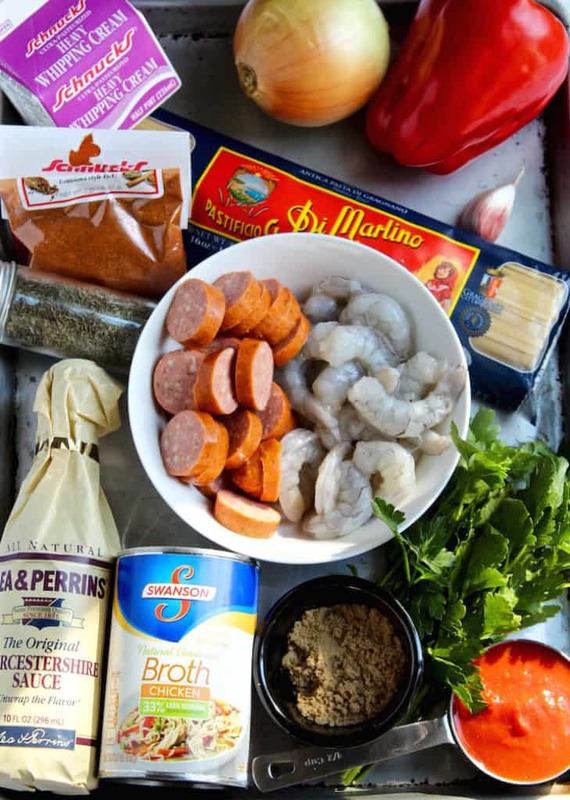 The combination of shrimp and andouille ~ a perfect match. And lately, I’ve been making this with bowtie pasta, I like the leftovers with bowties, a little easier to reheat. You might also like my Creamy Cajun Pork Chops, they’re delicious! 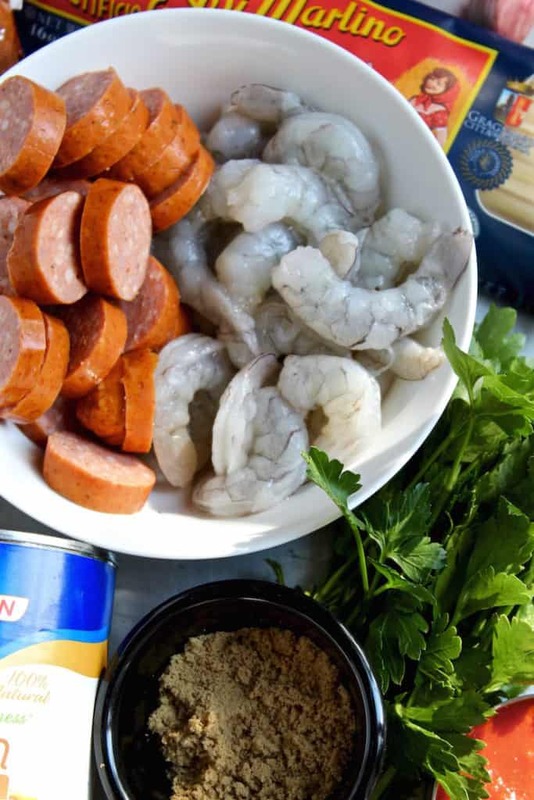 If you’ve tried this Creamy Cajun Shrimp with Sausage or any other recipe on the blog, then don’t forget to rate the recipe and let me know how yours turned out in the comments below ~ I love hearing from you! You can also FOLLOW ME on FACEBOOK, TWITTER, INSTAGRAM and PINTEREST to see more of what I’m cooking in my kitchen and recipes. Never miss a post ~ sign up for The Hungry Bluebird Newsletter for a weekly email of new content. Bring large pot of water to boil for pasta. Toss shrimp with 1 - 2 tablespoons of cajun seasoning and coat well. Heat a large skillet over medium high heat and drizzle bottom of pan with olive oil. Add shrimp and cook for 2 minutes or so until starting to curl. Flip shrimp over and cook another minute or two and then remove to a plate and set aside. Drizzle pan with a little more olive oil, add sausage and brown until nicely caramelized, about 4 - 5 minutes. Remove to plate, set aside. Add pasta to salted boiling water and cook until al dente, a minute less than package instructions. Lower heat to medium and add another good drizzle of olive oil to the pan, add the onion, red bell pepper, thyme, smoked paprika, 1 tablespoon cajun seasoning, brown sugar and a generous pinch of salt. Sauté until onion and pepper have softened a bit, scraping up any browned bits that you can. Add the garlic and cook until fragrant, about 30 seconds. Add crushed tomatoes, chicken broth and Worcestershire sauce and bring to a simmer, stirring and scraping up any brown bits from bottom of pan, simmer a couple minutes. Add cream and stir to combine, bring to a simmer. Once simmering, add cooked pasta and andouille sausage and stir to combine and heat through, 2 - 3 minutes. Add more chicken broth or cream if it seems dry or you'd like more sauce (I added ¼ cup of each). Salt and pepper to taste and then lastly, add blackened shrimp and combine, or place shrimp on top of pasta. Sprinkle with some more freshly cracked black pepper, grated Parmesan and chopped parsley. Enjoy! I found your recipe via google and made it for dinner tonight. It was delicious!!! The spicy sausage with the shrimp was wonderful. This was the most inspiring dish I’ve cooked in a long time! That makes me happy, it really does. I’m so glad you liked it! My husband loves it. My husband loves it, too! So do I ~ glad you liked it. 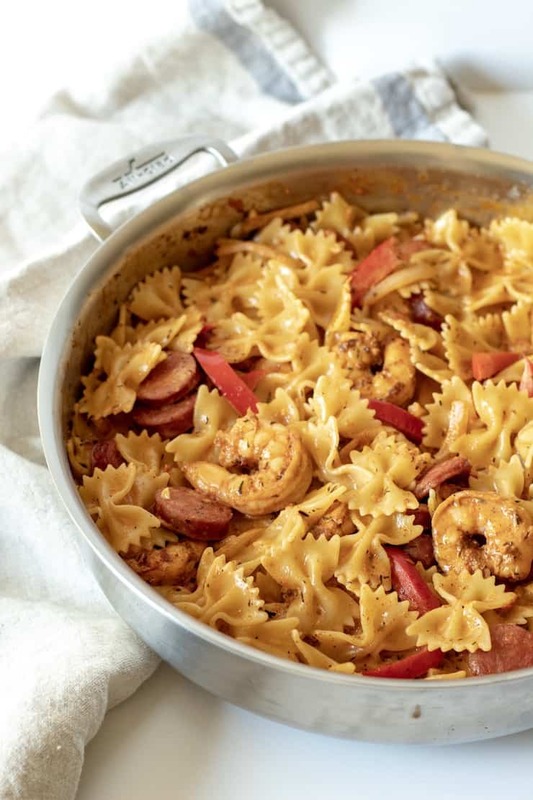 I love shrimp, sausage and pasta – throw them together with a kick of cajun and I think this is a winning recipe. Must try!!! Great idea with the rice ~ glad you liked it. I just made it and It was great. I should have added some more sausage because I’m a sausage person but I loved it. Thanks! Doubled up the measurements because my husband can eat 4 servings of pasta by himself (greek). He, my daughter and I all loved it. We love spicy so this was great! My family and I made this recipe for dinner tonight. We added a bit of red pepper flakes to add some spice as our andouille sausage was very mild. We usually change recipes up, but this recipe requires very little need for change. It’s full of flavor and very very tasty! Will definitely make again and would 100% recommend. My 6 yr old grandson said this dish is amazing. I added chicken to this and doubled the ingredients. I must say my self “AMAZING”! Thank you, it is amazing1 I’ve added chicken before, nice. My boyfriend and I love this meal! Thanks for the awesome recipe! Made this tonight and it is fabulous! My husband and daughter love spicy so it was perfect! I didn’t have crushed tomatoes so I used tomato purée. I also didn’t have andouille so I used turkey smoked sausage. It was still delicious!!! Thank you! This is a keeper! Your tweeks and substitutions sound just perfect ~ so happy to hear you liked this pasta dish. It is a keeper! 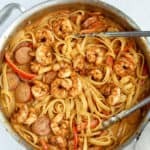 Thanks so much for letting me know you tried and liked this Cajun pasta! I really did try and come up with this recipe based on my favorite dish at a local restaurant. Glad your fiancé liked it! I just made this and it was awesome!! I didn’t have andouille so I used chicken smoked sausage. This is a keeper in my house! Glad you liked it! Smoked sausage sounds like a perfect choice. Just made this, just simply amazing. I didn’t have chicken stock but had beef stock on hand, it worked. Delicious and more than enough leftover to do lunch for both of us tomorrow! Was aiming for a hearty but special NYE dinner at home with my husband before we headed out, and it was perfect!! Added some chopped green peppers and spinach we already had on hand to the dish for leftovers today, and it was delicious the 2nd time around too! Definitely at the top of my repeat recipe box now! Made this twice in the past month. Followed directions to a T & both times, it is an absolutely devine, restaurant quality meal! Thinking about making it again today! Last time I made a double batch & took leftovers to work for lunch two days in a row. This dish is quick & easy to make, love the combination of cajun spices, brown sugar, worsteshire. Used heavy cream (not milk) & sauce turned out perfect both times. Just the right amount of heat but not overwhelming. Can’t go wrong with this recipe. My husband loved this and said he would order this at a restaurant. Thanks for the great recipe! It’s a keeper! I don’t think so, but I’ve never tried to freeze it. This sounds amazing. I have precooked, peeled and viened, frozen shrimp in my freezer right now. I was wondering if I would be able to use that instead of fresh shrimp and how I would go about using it. Ive never used precooked shrimp but I imagine you could try it. Toss the thawed shrimp with the spices and don’t cook very long, just a quick sear on each side. I love this recipe! I am from Louisiana, but spent 15 years in St. Louis. Now, I am in Dallas. What bistro are you referring to in your post? Rue Royale in St. Charles. I’m glad you like the recipe! It’s a favorite in my house, glad you liked it ~ mom, too! Great recipe. The family loved it (4 generations). Thanks! This makes me happy, thanks! Made this tonight because it sounded very close to a dish I had at a restaurant in downtown Cleveland. Instead of thyme and smoked paprika, I used Herbes de Provence and paprika. It was very close to the dish I had. Thank you for posting this recipe. It is absolutely delicious! My husband and I enjoyed it immensely. My girlfriend and I made this for dinner and it was so good! We added some crushed red peppers for a little extra spice and it was perfect. Thanks for great recipe! Can never have enough spice and heat! Glad you liked the recipe. I made this last night and it was delish! I am part creole and this was very good! Thanks for the receipe! Just made this….thank you, thank you for sharing. Nothing short of amazing. My boyfriend and I fought over who got to take the leftovers for lunch. Could not get enough of it! I hear you, my husband usually wins. This came out SO close to my favorite Gordon Biersch dish! OMG! ABSOLUTELY DELICIOUS!!!! Thanks, happy to hear this! My husband wants me to make this dish every Valentine’s Day! Delicious recipe. Been looking for a recipe that looked closest to what is served at a local restaurant (Polaris Grill) and didn’t want to waste time mindlessly cooking recipes that might not be what I was looking for. This recipe is the one I pulled the trigger on and took a chance. And am I ever glad I did! This hit the nail on the head and is exactly what I was looking for. Visited New Orleans about 2 weeks ago, couldn’t get enough of the cajun pasta. Had to make it at home. Decided to try your recipe, looks the most consistent with what I had in New Orleans. Let me tell you it was spot on! This recipe has been added to my book! You are so welcome. I’m glad you stumbled on my recipe, it’s a favorite in my house.